We have tried to take our Christmas picture this year, but we can’t seem to get three little girls to look at the camera at the same time. Hopefully tomorrow we will have three bright smiles! 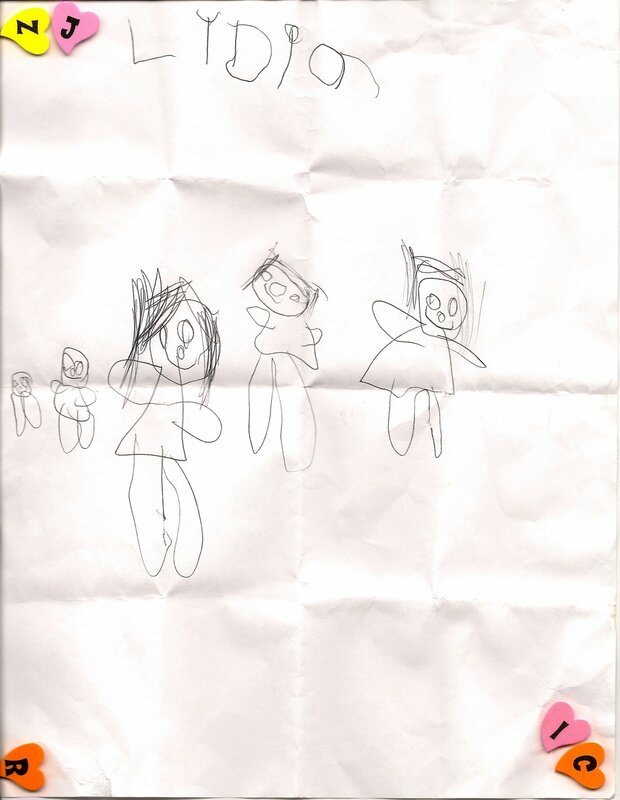 Lydia made this new picture and she really wishes that we could just mail it to her new siblings. Grace, Adie and Lydia are the bigger ones and the two little ones off to the left are her new brothers or sisters. They are loved so much already and we don’t even know who they are yet! So Carl and I are taking this Thanksgiving weekend to pray over this new situation, please join with us so we make the best decision for our family and that we would glorify God with the decision. Also pray that we would be able to work with our health insurance. I am totally amazed at how uncooperative they can be with an adoption. When you are self-employed, you fall into a totally different category which doesn’t carry the same standards as everyone else, so thus an insurance company can just say, “No” because they, the children, are older than 90 days old. And there is not much I can do about it. But with God on my side anything is possible and I am going to stand firm on that truth! Now this is only one decision that is on our plate right now, the other I can’t share publicly but it is heavy on my heart. I am trusting in God’s ultimate wisdom and grace. I am in the thick of packing for the ranch tomorrow! I hope I don’t forget anything too important…it is 50 plus miles to town! Now talk about crazy living! I can’t wait to post pictures from our adventures! In order for us to keep a diaper on Adie we have resorted to duct tape! She understands when she has gone to the bathroom but doesn’t like to sit on the potty. Grace and Lydia have found the two pairs of high heels that I own and run all over the house. I can’t imagine all the pairs of shoes that will be in this house in 10 years! I just found this picture from a couple of weeks ago of Lydia and I thought it was just beautiful. I could just eat her up!